I had some hesitation about posting a Good News Friday post today, what with the violent riots on the Gaza border and the terrible arson committed by the Palestinians against Israel, with fields and nature reserves burning down all over the south. But I came to the conclusion that we need some good news, if only to counter the depression that would otherwise settle over us. With this in mind it is appropriate to post two items concerning the south. Residents of Israeli communities surrounding the Gaza border will begin a massive tree-planting campaign this week in response to the destruction that has been caused by incendiary kites from Gaza. The project is the initiative of Ofir Levstein from Kfar Aza, and Friday marks the beginning of the week-long campaign. “The Sha’ar Hanegev [regional council] community, from all the neighborhoods, are invited to the tree-planting event this weekend,” Levinstein wrote in a post on Facebook. “Families, farmers, the old and the young – everyone is invited… We’re taking responsibility and creating the reality. They burn and we plant,” he wrote. He mentioned Nir Am, Erez, Nahal Oz, Kfar Aza and Miflasim as communities in need of restorative efforts. Keren Kayemeth LeIsrael – Jewish National Fund (KKL-JNF) is joining the residents in the campaign and will supply thousands of tree seedlings to be distributed and planted by residents. Since the start of the fire kite phenomenon, some 265 fires have been recorded, in which approximately 697 acres of KKL-JNF forests have burned. There were at least nine fires ignited within 40 minutes in the Be’eri forest on Thursday. Kol hakavod to Ofir Levstein on his fine initiative, and also to the KKL for joining in the efforts. On Monday, June 11, beginning at 5 pm, the City of Sderot, together with Mall 7 Shopping Center in Sderot, will be having a kite workshop (“Afifoniada” – kite is afifon in Hebrew) for the children of Sderot and nearby communities. During the event, children will hear stories, legends and interesting facts about the development of the kite. Afterward, each child will build his or her own kite, onto which they will write a personal message (such as: hope, renewal, building and security). At the end of the workshop, the children will fly the kites they made and create a spectacular “afifoniada” of positive messages. 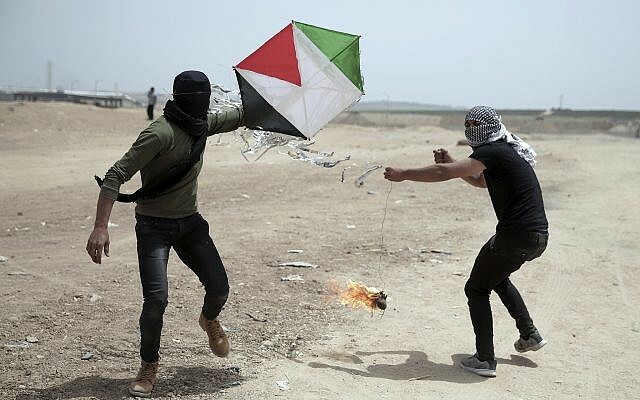 A huge kol hakavod to Sderot for taking back the kite from the arsonists of Gaza. I’m sure it will provide psychological healing for traumatised children as well simple good fun to participate in a kite festival. But I just wish Israel would go on the offensive for once, and not always be in a position of defence and reaction. But that’s for another blog. ​The Embassy of Israel in New Zealand had quite the busy week last week! Led by Ambassador to New Zealand Dr Itzhak Gerberg, a delegation from the embassy traveled to Hawke’s Bay and met with some local businesses, attended several receptions, gave a radio interview and even had the chance to meet with the Mayor of Central Hawke’s Bay. In a bid to meet some “real Kiwis” and boost relations and trade, the journey began with a stop-off at Vet Services and a meeting with GM Richard Hilson. A radio interview with Hawke’s Bay Central FM meant a lively discussion about the Middle East, New Zealand attitudes towards the region and the prospects for peace. A reception, organized by Hawke’s Bay Friends of Israel Chairman Mr. John McCormick, took place that evening. The event featured a wonderful performance by world-class Israeli Cellist Inbal Megiddo. The following day, the Ambassador met with the Mayor of Hawke’s Bay Alexandra Walker to discuss water management and water system design before a speech at the Institute of International Affairs at the Havelock North club. That evening brought about another reception for the celebration of Israeli’s 70th Independence Day with Pastor Nigel Woodley and the Flaxmere Christian Fellowship in Hastings. The lovely event featured a brilliant rendition of the Israeli National Anthem “Hatikva” played on a bagpipe. Kol hakavod to all the Kiwis at Hawkes Bay for organizing this wonderful event, and of course huge thanks from us in Israel for their constant and loyal support of Israel. What a wonderful man! Thank you for your courageous stand and for your staunch support. Talking of supporting Israel, here is a really cute initiative – a Guinness record for the biggest Israel flag created out of … cookies! And one last item before I close. This very clever 11th grader, son of my friend Hannah Katsman, built this brilliant robot that solves Rubik’s cube! With the young generation of this young man and his friends, Israel has a very bright future! On this happy note, I wish the residents of the south – and all of Israel – a safe, quiet and peaceful Shabbat. This entry was posted in Defence and Military, Incitement, indigenous rights, International relations, Israel news, support Israel and tagged fire-kites, Gaza, Good News Friday, New Zealand, Palestinians, reforestation, southern Israel, support Israel, technology. Bookmark the permalink. What great ideas the residents of the south have.But that is our Israelu/Jewish spirit.They (our enemies )rage ,burn, kill,&we make positive ideas out of this. Would that the while world turn against these Gazan animals.